Confession – I love chocolate. I know, it’s not really that shocking of a confession. Let’s be honest – pretty much everyone has a place in their heart for the rich, melt in your mouth delight, be sweet milk chocolate or bitter dark chocolate (and if you don’t, what’s wrong with you?! Just kidding…maybe). Just think of all the holidays we celebrate with the good stuff – Easter, Valentine’s, Christmas, Friday…wait, what? We often associate chocolate with a treat or an indulgence, and certainly some chocolate containing foods probably do fall into that category. But it also contains health-promoting antioxidants, as well as a variety of trace minerals (such as iron). Not to mention just the act of eating chocolate can bring about a sense of pleasure and well-being. 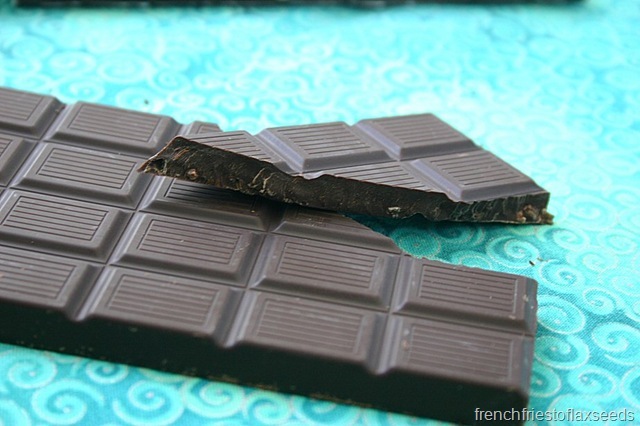 Generally speaking, the darker and purer the chocolate, the greater the health benefits. Now, I’m not one to pick up the standard candy bar at the super market check out, because those barely even qualify as quality chocolate. But I have a tendency to amass large numbers of unique, artisan chocolate bars. The silly thing is I buy these chocolate bars, then put them away and forget about them. So I’ve decided it’s about time I start a series on the blog chronicling my chocolate collection. Because an uneaten chocolate bar has hardly met its chocolate destiny. Today we will take a look at Alter Eco Organic Dark Cacao Chocolate. I think I picked this bar up when I saw them on sale at one of our local organic markets. Because good chocolate is even better when it’s on sale. Alter Eco works with small-scale farmer’s to select the best fair-trade organic cacao, and combines this with organic cane sugar to produce a quality product free of emulsifiers and artificial additives. 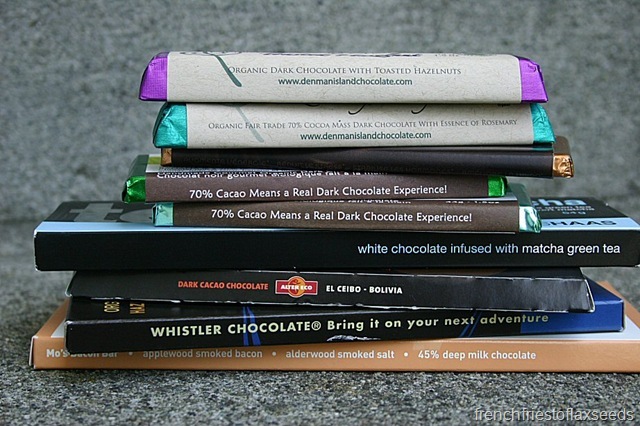 What’s great is that you also know exactly which cooperative the chocolate for each bar comes from. 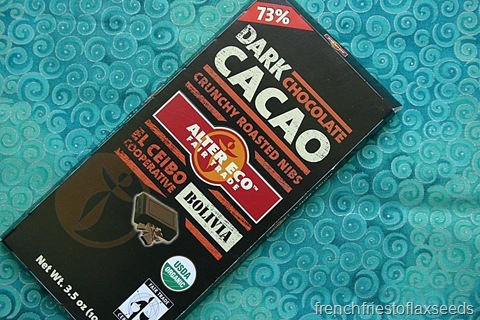 For the Dark Cacao Chocolate, the cacao comes from the El Ceibo cooperative in Bolivia. 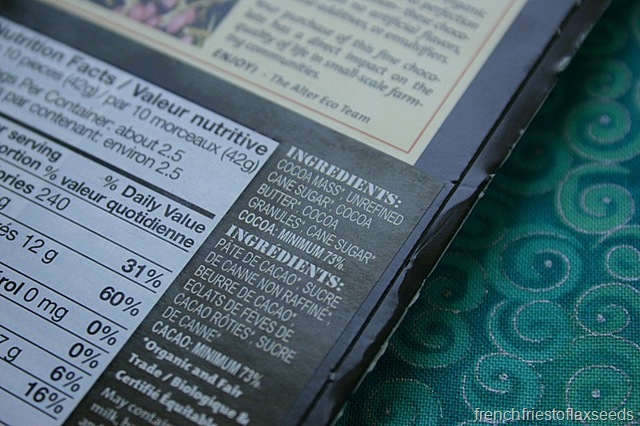 As you can see, the ingredient list is short and sweet for their Organic Dark Cacao Chocolate – cocoa mass, unrefined cane sugar, cocoa butter, cocoa granules, cane sugar. 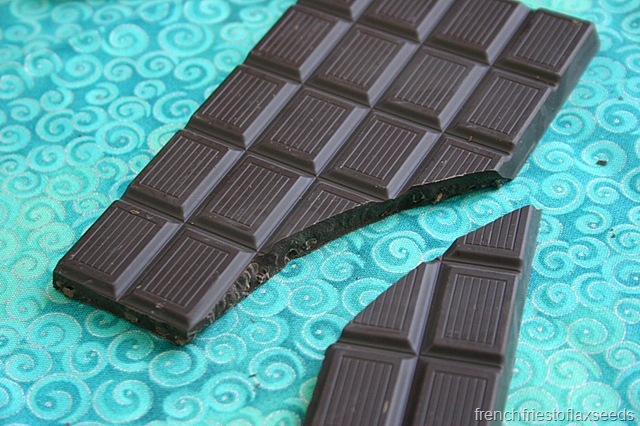 Just look at that beautiful dark chocolate, studded with crunchy cacao nibs. This is a nice, clean, dark chocolate. No competing flavours for the chocolate purist, and sweet enough that it would appeal to those who aren’t into extreme dark chocolate. 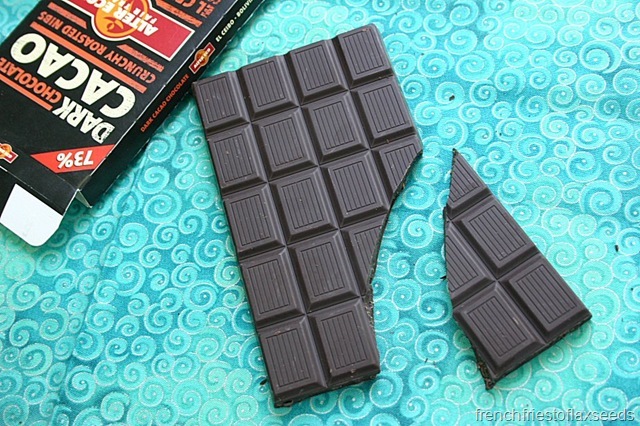 Not to say it’s a super sweet chocolate bar – you definitely get some of that bitter dark chocolate flavour – but for someone used to very sweet chocolate I think this would be a great “entry bar” into the world of dark. The cacao nibs also give this bar a nice bit of texture. What I find great about quality dark chocolate is that you seem to be able to satisfy a chocolate craving with less chocolate. A few squares, and you are generally content (although sometimes that chocolate monster is insatiable regardless of what you feed it!) It does take a bit to train your taste buds to enjoy a more bitter chocolate, but the same can be said with many foods. And once you are able to appreciate the finer points of dark chocolates, it really opens up a whole new chocolate-covered world for you. I love the way the chocolate looks against the turquoise background. Looks so awesome! 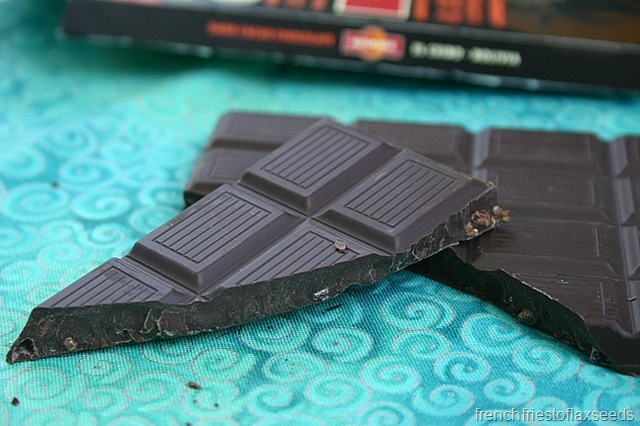 I also really like cacao nibs in chocolate bars. The crunch adds a great texture. Alter Eco is one of my Favorite!!! They taste much richer than the percentage they say on the package! mmm! i like milk chocolate and white chocolate 🙂 and YES, i can’t believe you havent had pho! AND YOU ARE IN VANNY! go get some!